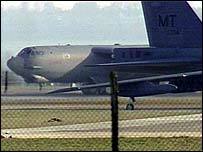 The cost of policing RAF Fairford during the Gulf war has been revealed as £3m. Gloucestershire Constabulary's chief constable, Tim Brain, says it was the largest operation ever undertaken by his force, which lasted from January to spring. The NATO-designated forward base for US warplanes was home to 14 US B-52 bombers during the Iraq war. Peace protesters set up camp from February onwards, with many arrested over the course of the conflict for various offences. Most of the £3m will come from the Home Office, but the county force will have to find £375,000 from its own reserves. In March, the government awarded Gloucestershire Police a grant of £250,000 to help with the extra policing costs. Armed patrols and officers from other forces around the UK had all been brought in to police the base.